Mary Brown Napangati was born in approximately 1953 and comes from a bush camp at Mandarine, south west of Yuendumu in Central Australia. She lived a traditionally Indigenous lifestyle while she was growing up and was introduced to gathering bush tucker, bush medicine and craft and bead work for traditional ceremonies at a young age, as well as being exposed to the cultural knowledge and Dreaming stories of her country. Mary first began painting in the early 90's, at first sporadically, as there was no art centre where she lived. 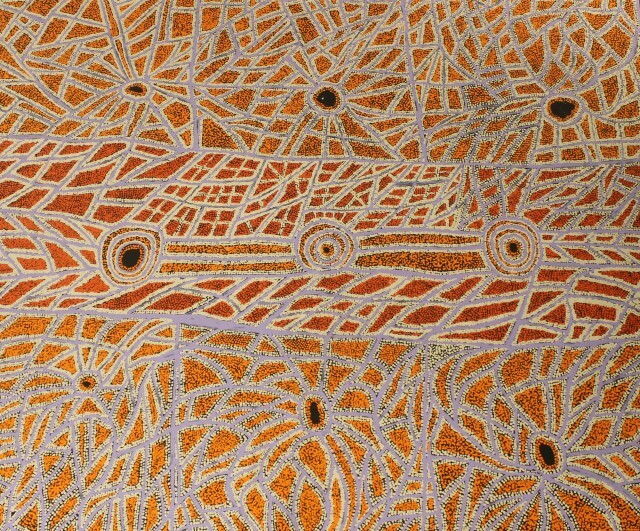 In 2005, she began painting for Warlukurlangu Artists Aboriginal Corporation in Yuendumu and since that time has began painting with much more frequency. The themes and scenes included in her artworks are of traditional women's ceremonies and Dreamtime stories that relate to the land. She uses traditional iconography in her artworks but uses an array of different colours that aren't typically indigenous, to develop a modern interpretation of her Dreamings.